The for statement differs from what programmers of C or C++ are used to. The for statement of Python looks a bit like the for loop of the Bash shell. We often need to go through all the elements of a list or perform an operation over a series of numbers. The Python for statement is the right tool to go easily through various types of lists and ranges. The above call produces the list of numbers starting with begin (inclusive) and ending with one less than the number "end". 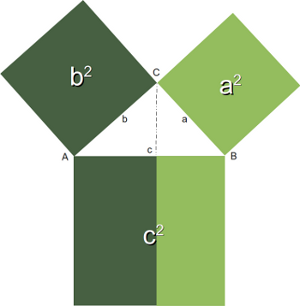 Generally, it is assumed that the Pythagorean theorem was discovered by Pythagoras that is why it has its name. But there is a debate whether the Pythagorean theorem might have been discovered earlier or by others independently. For the Pythagoreans, - a mystical movement, based on mathematics, religion and philosophy, - the integer numbers satisfying the theorem were special numbers, which had been sacred to them. These days Pythagorean numbers are not mystical anymore. Though to some pupils at school or other people, who are not on good terms with mathematics, they may still appear so. Three integers satisfying a2+b2=c2 are called Pythagorean numbers. The following program calculates all Pythagorean numbers less than a maximal number. Remark: We have to import the math module to be able to calculate the square root of a number. Remark: If you apply len() to a list or a tuple, you get the number of elements of this sequence. What will be printed by "print colours"? We still might have done something, what we shouldn't have done. We changed the list "colours", but our change hasn't had any effect on the loop anymore. The elements to be looped remained the same during the iterations.